Paint the wooden spoon grey and leave to dry. Cut two small triangles from grey felt for the ears and glue on. 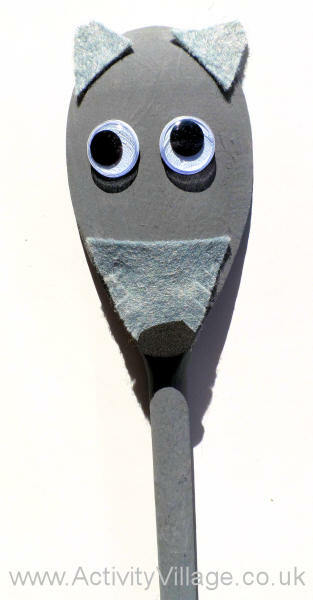 Cut a large triangle for the muzzle, snipping around the edge of the muzzle to make it shaggy, and glue on to the spoon. Stick on a small black felt circle for the nose and the wiggle eyes. This adorable little "bean bag" wolf is made out of - you guessed it - an old grey sock! He's much too cute to throw around like a bean bag, though. Children will need simple sewing skills to make him.